Many NFL players choose National MS Society as their cause in the “My Cause, My Cleats” program. This season, NFL players and coaches participated in My Cause, My Cleats, a program that allows players to wear custom cleats to promote causes important to them. Each team will have a designated home game to wear their cleats and help raise awareness. 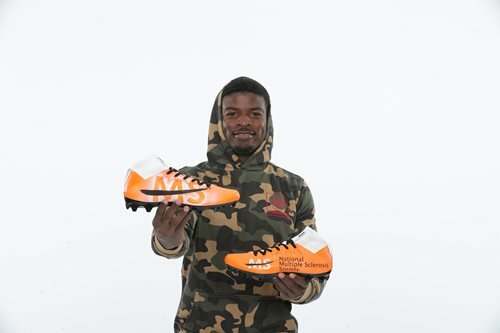 In the end, the cleats worn by each player will be auctioned off, with 100% of the proceeds going to the cause of their choice. Many chose the National MS Society as their cause because of close, personal connections to the disease. DJ Reed, Defensive Back for the San Francisco 49ers, who’s dad lives with MS.
DJ Reed –Defensive back, San Francisco 49ers | “My dad has had MS since 2004, and I’ve seen the transformation firsthand and how it has impacted his life. I want to bring awareness to this disease,” says DJ. 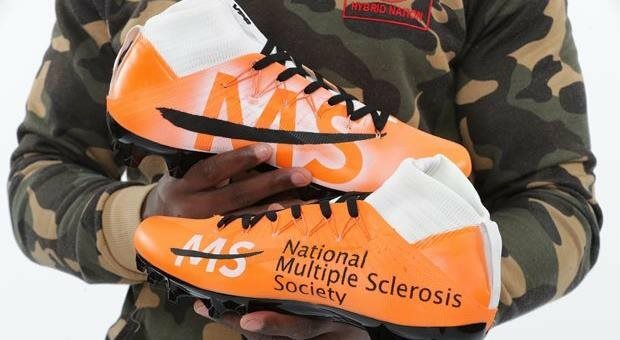 Myles Garrett – Defensive end, Cleveland Browns | Miles’ cleats honor his grandmother, Pauline, who was diagnosed with MS.
Dirk Koetter- Head coach, Tampa Bay Buccaneers | Dirk wore his shoes in honor of his mother and sister, who live with MS. He also pledged $5,000 to help support the work of the National MS Society. Dan Feeney – Guard, Los Angeles Chargers | “I first learned of the National MS Society two years ago when my sister joined the staff in Chicago. Over the last two years, I have become aware of all the good things they do, from fundraising and programs to help individuals and families affected by this disease. My hope in showcasing the Society for the My Cause, My Cleats campaign is to bring awareness to this disease and to be a part of the fight to end MS forever,” Dan shares. Sean Culkin – Tight end, Los Angeles Chargers | “Blessed to have the opportunity to represent The National MS Society for My Cause, My Cleats this year. My grandpa, Richard Noggle, battled this disabling disease for many years. Thankful to honor my grandpa’s impact on my life and raise awareness to support the Society,” says Sean.